Veronica Roth is releasing a Four-focussed short story We Can be Mended as a part of promotions for her upcoming book Carve the Mark. Find out how to get your copy! Initiates, I know the whole Ascendant TV movie situation is creating some uncertainty (though, I feel optimistic that it’ll work out… read more HERE); however, today, Veronica Roth gave the fandom a massive reason to celebrate. Earlier this year, Queen V announced her new science-fiction fantasy series, starting with Carve the Mark, coming January 17, 2017. It’s great news to hear we’re getting something new from Veronica, but Divergent will always have pride of place in my heart. So to get fans even more excited, today she announced that she’ll be releasing a never-before-seen epilogue to Allegiant called We Can be Mended! 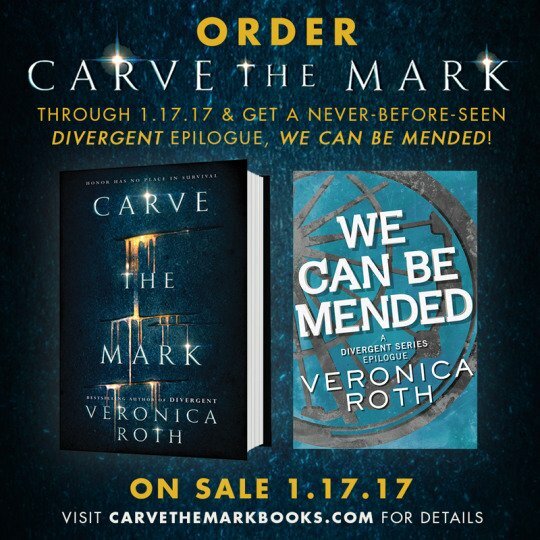 Anyone who pre-orders a Carve the Mark will receive an exclusive copy of We Can be Mended, too. We Can Be Mended takes place five years after Allegiant, and tells us what Four has been up to. First, pre-order Carve the Mark online or at your local bookstore or purchase it the first day of on sale (January 17, 2017). Next, upload a photo or screenshot of your receipt and submit the information to CarveTheMarkBooks.com. You must do this by January 17, 2017. Then, a mini-book containing We Can be Mended will be mailed to you AFTER January 17, 2017. I’m so excited to hear from Four, but I’m also nervous too. I want him to be happy, truly… but if Tobias has a girlfriend that’s not Tris? What do we do? Regardless, pre-order Carve the Mark right now so you can get We Can be Mended ASAP. I know I will!